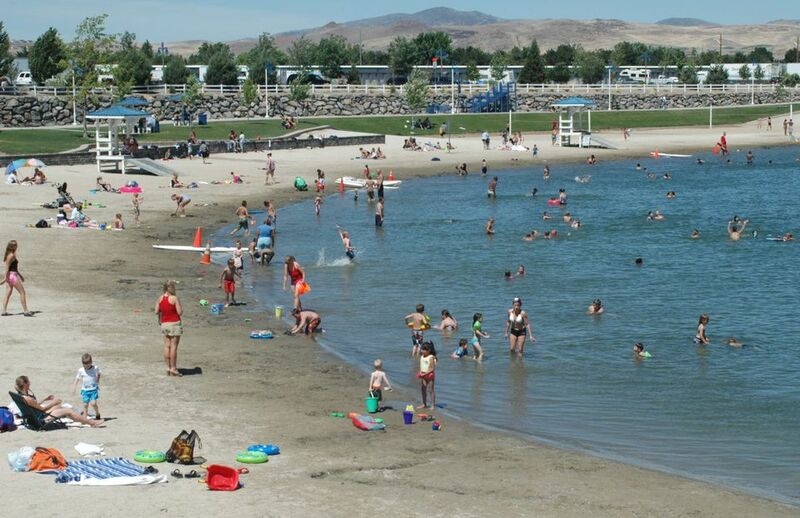 Sparks Marina Park is one of the biggest and most well-known parks in Sparks, Nevada. The park provides a wide variety of recreational opportunities to residents of Sparks and the entire Truckee Meadows region. The centerpiece of the park is 77 acre Sparks Marina Lake, providing one of the best public swimming holes in the area during the hot summer months. The entire park is 81 acres. Sparks Marina Park offers residents and visitors alike with many recreation facilities. Whether you want to host a big family picnic or birthday party, take the kids swimming, visit the dog park with Bowser, stroll the path around the lake, or just relax on the grass, you can do these and more at Sparks Marina Park. To see the layout of the facilities listed here, download a map of Sparks Marina Park. For information about renting a group day use area, call Sparks Parks and Recreation at (775) 353-2376. Other popular activities at Sparks Marina Park include scuba diving and boating (only electric motors are allowed). You must have a Nevada license to fish. Fishing is prohibited in swimming areas and the daily possession limit is three. Other special events also use Sparks Marina Park on occasion. Some of these have included sand volleyball tournaments and wakeboarding competitions on Sparks Marina Lake. The parking area and main facilities at Sparks Marina Park are located at 300 Howard Drive in Sparks, Nevada. The park and lake are on the north side of Interstate 80 and between N. McCarran Boulevard on the west and the big Scheels store in The Legends shopping center on the east. The easiest way to reach the parking lot is from N. McCarran on either Nichols Boulevard or East Lincoln Way. The hole in the ground that holds Sparks Marina Lake used to be an industrial area known as Helms gravel pit. Over the years, enough tons of rock were scooped from the pit for road construction projects that it became about 100 feet deep. Plans to turn the area into a park with a modest lake were in the works when the big Truckee River flood of 1997 hit. Literally, overnight, the Helms pit filled with around a billion gallons of water, creating Sparks Marina Lake. An underground spring constantly adds an estimated 2 million gallons a day to the lake, so the excess is discharged into the Truckee River in order to maintain the lake level. This keeps the lake fresh and clean for recreational use. For more on the history of the Helms pit, refer to "The Gravel Pit That Became a Lake" by Rich Moreno.